I considered buying the complete String Quartets of Shostakovich for some time, unable to decide if the Emerson or Borodin (minus the 14th and 15th) would be the one I wanted. The playing of the Emerson was certainly in their favor but I settled on the Fitzwilliam String Quartet after reading a review of this set. The Fitzwilliam may not play as well as the Emerson or have the Russian advantage of the Borodin but they have captured the emotion behind the music as no other quartet. The Fitzwilliam also worked with Shostakovich and were given the honor of the Western premiere of the 15th Quartet, so there is an element of authority to their playing. Throughout the set, I was impressed with the playing and depths of feeling expressed. The quartets appear in composition order on the 6 discs allowing the listener to follow how Shostakovich developed the form. Each CD is in a paper envelop inside a box. The accompanying booklet described each quartet and provides insight into their composition. The recordings are clear and nicely balanced, perhaps not as refined as the sound of the Emerson but certainly excellent. I knew only three of the quartets well before I got this set, and I recommend taking the plunge and buying all of the quartets if possible. 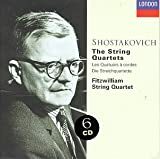 In sum, this is a rewarding complete set that will be of interest to the listener who wants to follow Shostakovich's development of the string quartet. The soul of a man! Like Haydn, Mozart, Beethoven, Schubert and Bartok, Shostakovich decided to dare himself to compose truly, the most profound and intimate of all genres of chamber music. The string quartets constituted for the previous named composers a sort of intimate diary of profound reflection around and about their human condition, historical perspectives and personal statement. No other soviet composer achieved such level of dense expressive grandeur and like Bartok, Shostakovich found out in this genre the perfect device in order to convey to a selected audience who, far from the crowding applauses, the repeated ovations, noisy acknowledgments and the great energetic display of overpowering orchestral masses, could to get close still more to that narrow circle of sublime grandeur and opened heart expressiveness. Perhaps it was a mere coincidence (I don't think so)to have composed exactly 15 Symphonies and 15 String quartets, but the certain of the case is that Shostakovich began to compose these chamber works since the times of the Eighth Symphony. Needless to affirm we have a musical genius in absolute domain of his powers. Like Bartok, it's definitively useless to intend to understand the minimum facets of the soul of a man like him and his Hungarian colleague in case you do without these emblematic works. In this particular set you will find out by far, the most extraordinary and musically idiomatic performances of his musical legacy. It would not be exaggerate that this renowned quartet will be reminded in the memory of the future by this priceless effort, and their most legitimate and coveted masterworks. Don't think it twice and acquire these legendary musical treasures. Opportunity Waits for No Hominid! Do it! Buy! Shostakovich's string quartets are as much the supreme masterworks of 20th Century music as Beethoven's were of the classical period. I hardly dare say more about them; they are profound on every level, and like Beethoven's, they grow more profound with every listening. Shostakovich, in a sense, discovered the Fitzwilliam String Quartet when its members were undergrads at Cambridge. He entrusted the first western performances of his last three quartets to them for premiere, and they in turn made the first western recording of his full quartet cycle. For many buyers the choice for a complete cycle of the Shostakovich quartets will come down to three: the Borodin, Emerson, and Fitzwilliam quartets. I own the latter two and can offer a comparison. Fitzwilliam: This set, made between 1975-77 in a church in Surrey, has the advantage of price. Although the 15 quartets are spread out over 6 CDs as compared to 5 for the Emersons, Decca offers this cycle at roughly half the cost of the DG cycle (it's much cheaper than that, even, on the used market). The performances eschew Russian soul, grit, and emotional extremes such as one hears from the Borodin Quartet. The Fitzwilliam Quartet sounds soulful but stops short of impassioned. As much as it is possible, they make this music friendly and easy to listen to without sacrificing all of its bite and sarcasm. They are not a virtuoso group (English critics actually praise them for this lack, as if the Emersons' technical mastery was a sign of glibness), so individual solo lines, of which there are many in these quartets, sound medium well played, not dazzling. Decca's sound as transferred to CD can be a bit shrill and congested but is certainly good enough. One large missing ingredient is tonal variation--the Fitzwilliam doesn't search out the peculiar tonalities that are implied in Shostakovich's string writing, which can be eerie, ghostly, brutal, and caustic by turns. Emerson: Recorded in Aspen at intervals between 1994 and 1999, these are live performances from the music festival and are thus not ideal sonically. What's most lacking is solidity and body. Even so, the recorded sound is considerably more detailed than in the Fitzwilliam set, or any other of the four I listened to. When this cycle was first issued in 1999 it swept the field for good reason. The Emersons are head and shoulders above any other quartet for sheer virtuosity in this music. Not that virtuosity is required very often, but the many solo lines are rendered with exquisite technique, and the Emersons pay very close attention to changes in tonality. As a result, these performances are more varied and interesting to listen to than any competitor that I sampled (including the Fitzwilliam, Brodsky, Borodin, St. Petersburg, and Shostakovich quartets on various labels). The drawbacks are price (it's hard to find even a used set for under $70) and the prevalent accusation, from some quarters, that the Emersons lack Russian soul--they are supposedly too cool, detached, and efficient. Yet this charge can be turned around to say that the Emersons make Shostakovich sound more modern by removing a layer of sentiment. It's really up to the listener to decide, yet I found that cool detachment is not prevalent here--not by any means--and the reviewer below who thinks that the tempos are uniformly too fast is not aware of the field; the Emersons are not extreme in their allegros, at least not very often, and when they play a movement for virtuosic speed, it's almost alwaays to good effect. I bbught this set because I heard the Emersons play Shostakovich in concert on two occasions, and I was deeply struck by how much better these quartets sound when they are given superlative musicianship. I am not one to believe that Shostakovich was a great master of quartet writing compared to Bartok, Schoenberg, and Janacek among moderns. But he found an idiom, often spare and therefore one-dimenisonal, that is easy to absorb. The Emersons go a step further and give that spare idiom all kinds of shading and colors that often make it sound better than it is. There are perhaps several complete Shostakovich cycles one would like to own for these amazing pieces, and this is one of them. Not every single quartet is perfect, but that is to be expected. What these players excel in is an emotional depth that is perhaps left behind in the sheer brilliance of the Emerson SQ's playing. Their tempi are excellent: fast when necessary, and painfully slow where Shostakovich asks for it. Perhaps my favorite point of their playing is the articulation, which is broader than most recordings I hear. Typically, they only play short when asked to in the score, and I think this sounds better than, for instance, if the opening of the Fifth Quartet, a work of enormous gravity and passion, is taken lightly. Tout ¨¤ fait simple, c'est un merveilleux quatuor qui a su s'engloutir dans la path¨¦tique et fascinante bulle, unique ¨¤ shostakovich, nous faisant savourer chaque facette de chaque mouvement constituant les quatuors de D.S.. Le tout petit trouble est ¨¤ l'enregistrement, ¨¤ la prise de son je crois, puisque dans toutes les plages du coffret, un l¨¦ger vrrrrrrrr!, ¨¤ tr¨¨s bas volume est en constante pr¨¦sence, ce qui limite quelque peu les possibilit¨¦s de l'¨¦coute. Malgr¨¦ tout, ce coffret constitue l'une des meilleurs verssions des quatuors de D.S., Je le conseil donc ¨¤ tous. Excellent Performances! Excellent Sound Quality! Although a great symphonist it is Shostakovich's original and personal quartets that have always impressed me the most about this Russian composing genius. Now we get all 15 in one compact and very well packaged set performed brilliantly by the Fitzwilliam String Quartet as well. The sound quality is also very, very good thanks to a brilliant sound engineering and production job; the acoustics at the All Saints Church in Surrey, England where this was recorded must be fantastic to produce such a great sound experience! The Quartets here for those not already familiar with the composer's works can be an acquired taste for some as they bear little if any resemblence to the quartets one usually hears from composers like Beethoven and Schubert and can even sound extremely discordant at times reflecting the intended inner turmoil or moods the composer wants to portray. In fact, at some points the soundtrack/score to the Hitchcock movie "Psycho" comes to mind. Still, Shostakovich's work with his quartets is important in the new, unchartered waters he allowed this format to stretch out into reminding me a lot of how Ornette Coleman or even Thelonius Monk for example stretched the accepted jazz format at the time to discover new horizons at least in the expressiveness of the genre if not so much in making wholesale changes to the genre in itself. For this reason, I never tire of listening to this set of quartets and you'd be hard pressed to find a better recording and collection than what you have here. Included in this very well put together cardboard box set is a 44-page booklet which contains the track listings together with an essay on all 15 quartets by Alan George in English, French and German. Each of the 6 discs are well-housed in well-designed cardboard square sleeves as well making this overall my favourite classical music box set of my entire collection. With the Borodin cycles and the Emerson cycle out on CD this very good set tends to get overlooked. There are a lot of things I like about this set better than either the Borodin or Emerson set. I prefer this set to the Borodin set because the engineering is more satisfying. You get a more intimate sound with this set. For those who are curious, the other selling point is that Fitzwilliam gave the Western premiere of the Fifteenth quartet and were one of the last groups to work with the composer before his death. And while the sound isn't as crisp as what you'll find on the Emerson set I prefer their handling of the large-scale structure and emotional content of the 3rd and 7th quartets (not that this is anything other than personal preference). To those of you like me, bred off the strictly diatonic classical and romantic periods, when melody and counterpoint were fitted nicely within keys, the twentieth century can be a frightening place. I have a hard time making sense of atonal music (much of Bartok's quartets, for example). But Shostakovich's quartets make sense to me, even though he sometimes wanders through the chromatic scales and forsakes a set key. This package is a wonderful offer, and a good introduction to the composer's later work. They are quite different from his early symphonies. Much of the music is so emotive its palpable, and the emotions range from burlesque, to grotesque, to deeply wounded and plaintive. I love the largo from quartet six, a surprisingly diatonic and elated quartet in comparison with the others. When you get this set, wander off by yourself for a day and listen to each quartet. I can't guarantee you'll like them all, but I hope you have the sense to appreciate these for what they are.